Casar rope is versatile and has varied uses. These include Mobile Crane Hoist Rope, Piling Hoist Line, Tower Crane Hoist Ropes, offshore cranes, ship deck crane hoist ropes and other marine environments, among others. 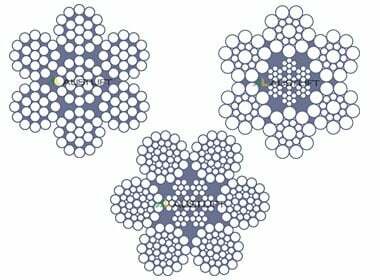 In addition to a good structural ability, which allows both the core and the outer strands to balance each other out, the different types of Casar rope have many good qualities such as abrasion resistance, crushing resistance, rotation resistance, flexibility and fatigue resistance. There are Casar special wire ropes made of either conventional strands or compacted strands. Compacted strands are produced by taking a conventional strand made of round wires and drawing it through a compacting tool. Compacted ropes have far greater resistance to corrosion and abrasion. They are also more flexible and their breaking load is higher. All About Lifting & Safety offers you high performing Casar wire rope with proven durability for all your applications. We have the technical know-how on all the different Casar Ropes in the market, and will advise you on the best Casar rope for your application. Our team is on hand to not only supply you with Casar rope, but to also advise you on the appropriate Casar wire rope to match your needs. We have over 80 years combined experience in lifting and safety solutions so you can rest assured in our ability to offer you the best solutions in the market.